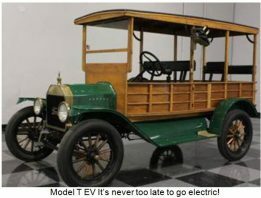 Interested in seeing a 1914 Model T that was converted to an electric vehicle? There are two upcoming opportunities – one from 11 a.m. to 2 p.m. this Saturday during the Electric Vehicle Club meeting at the Whole Foods Store, 6730 Papermill Drive, Knoxville and the other from 10 a.m. to 12 noon Monday (November 12) at Frank Lorino Park in Morristown. John McMillan and the Shockwave Motors Team, which created the Defiant EV3 All-electric Roadster™ that we have spotlighted on numerous occasions, completed the conversion of the oldest gasoline powered car to electric power. The vehicle started out life as a 1914 Model T Hack and was originally used to transport people from a train station to hotels. Here’s a picture of the vehicle.